Lighting up your landscaping is one of the things you can do to your home that can really increase your curb appeal. After all, great curb appeal doesn’t just happen in the daylight! Your home should look great at night, too. The right exterior lighting in your Houston-area home can make your home look more expensive, more welcoming, and even make it a safer place. It can even give you a special place to spend your evenings instead of being cooped up inside. Bad exterior lighting, though, could end up making your home look more like a prison yard and less like a gathering place for family and friends. We’ve been working with Houston homeowners and landscapers for more than fifty years, helping them find the right exterior lighting for their properties and projects. During that time, we’ve learned a lot! 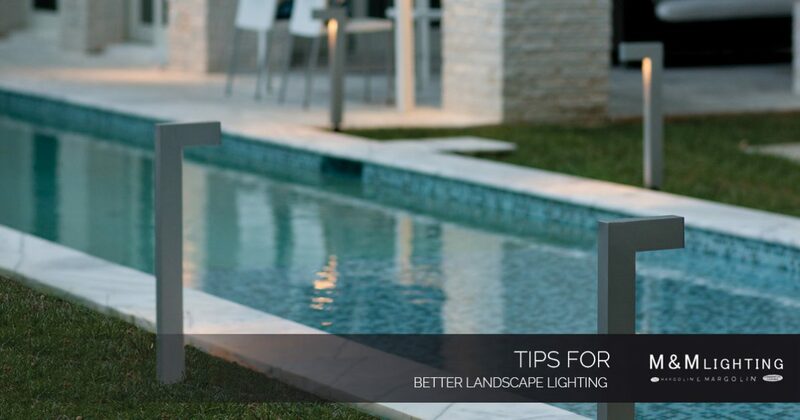 Here are some of our favorite tips for lighting your landscaping perfectly. See if any of these ideas are right for your yard! Highlight a special tree or garden feature. What’s special about your garden or yard? Maybe you have a beautiful old oak tree or a fountain that’s become a treasured centerpiece of your yard. Whatever makes your space special, that’s why you need to highlight with lighting. A big, beautiful tree looks even bigger and more beautiful when it’s being flooded with uplighting. Or light up your fountain with carefully placed and aimed spotlights. Remember that you can easily change out the bulbs for colored lights for a more festive look during the holidays, too, making it easier than ever to get in the spirit of the season. Use rope lights to outline your flower beds. Flower beds look terrific when they are outlined with rope lighting. It’s also incredibly easy to install. Simply create a small trench along the border of your flower beds, either next to the grass or by your pavers. Then tuck the rope lighting into place. That’s it! The effect provides a gentle flow that will create some interesting shadows without overwhelming the space with too much light. Using the rope lights as an accent to a central focal point is a great combination that will look absolutely stunning. Use downlighting on your pathways. Lighting the pathways around your home is always a smart idea. Not only does it make your home look more inviting, it’s great for guest safety. After all, you know about that step in the middle of the path, but your guests might not. Giving them a little light to help guide their way will be much appreciated. If you choose to light your paths and walkways, stick to downlighting. This will help direct the light onto the path instead of into your guest’s eyes and creating a glare. This is an ideal use for solar lights! Use uplighting on your home. Highlighting the interesting architecture of your home is a wonderful thing to do with landscape lighting. It’s best to create those highlights with uplighting, though. Downlights on architecture can make your home like ominous and create strange shadows. Give a wall or area of your home a wash of light by placing a flood or spot down low and carefully aiming it along the wall. The effect adds a little drama and a lot of interest in your outside space. A little light goes a long way at night. Remember, when you are lighting your landscaping you are going to be using it at night. In the dark, a little bit of light goes a long way. Don’t assume that because it’s in a dark corner of your yard that you need to use the highest wattage bulb available. In fact, you may find that the nicest lighting effects are created when you use the lowest wattage bulbs or even when you carefully screen the lighting. Play with the idea that less is more when it comes to lighting and you’ll appreciate how a little light can turn a dark corner of your property into a romantic haven. Ready to Stock Up on Exterior Lighting for Your Home? M&M Lighting has what you need! You can shop for your exterior lighting on our website or come into our Houston showroom and see our selection in person. We’d love to help you find the perfect fixtures to execute your carefully designed landscape lighting plans. And if you need more ideas, our team has them! With our years of experience in the business, we can help you discover new ideas for your landscape lighting that you’ll absolutely love. Stop by our showroom or make an appointment with one of our lighting experts now by giving us a call or contacting us through our website. We’re looking forward to help you make you exterior lighting ideas a reality!